For our design special edition of Boat International, we spoke to the world’s most prominent superyacht designers to see what new designs they have up their sleeves. Here’s what we found… What is it? A chiselled 58 metre motor yacht from the renowned London-based design studio Bannenberg & Rowell. Why we love it The sharp, angular lines catch the eye, with a pair of fins atop the superstructure concealing the satellite domes when viewed from sea level, but it is the interior layout that really sets this design apart. The dining area is situated aft of the saloon to give sea views on three sides while enjoying a meal. What’s more, the main deck tender garage allows Project XS to store and launch a much larger dayboat than usual. A chiselled 58 metre motor yacht from the renowned London-based design studio Bannenberg & Rowell. The sharp, angular lines catch the eye, with a pair of fins atop the superstructure concealing the satellite domes when viewed from sea level, but it is the interior layout that really sets this design apart. The dining area is situated aft of the saloon to give sea views on three sides while enjoying a meal. What’s more, the main deck tender garage allows Project XS to store and launch a much larger dayboat than usual. What is it? Styled to appear slimmer than she is, Aurora is the latest 140 metre concept from the boards of world renowned studio Nuvolari Lenard. Why we love it Balancing sleekness and interior volume is a common challenge for briefs in the 100 metre plus size bracket. 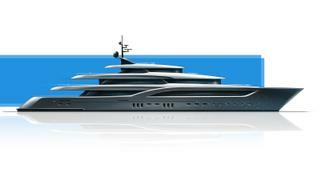 The designers have pulled this off with aplomb and retained star features like an infinity pool and superyacht beach club in the stern. Styled to appear slimmer than she is, Aurora is the latest 140 metre concept from the boards of world renowned studio Nuvolari Lenard. Balancing sleekness and interior volume is a common challenge for briefs in the 100 metre plus size bracket. The designers have pulled this off with aplomb and retained star features like an infinity pool and superyacht beach club in the stern. What is it? 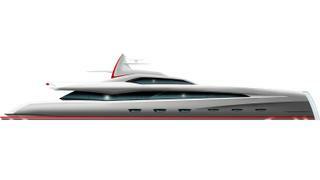 As the name would suggest, a 76 metre motor yacht concept from Dutch studio Mulder Design. Why we love it Balancing modern technology, timeless style, speed and comfort was the crux of the matter when developing this particular concept. 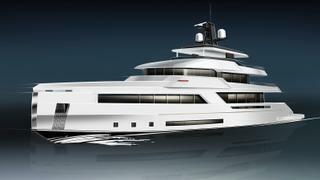 “This is a yacht for people who want the best in terms of quality and lifestyle,” explains designer Bas Mulder. 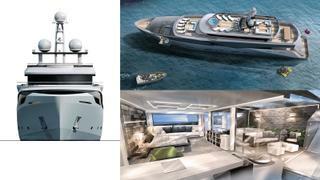 To this end, the concept includes accommodation for up to 12 people and a Jacuzzi on the superyacht sundeck. But it is the main deck that is the undoubted star of the show, with its surprisingly spacious aft-deck pool and on-board cinema room. 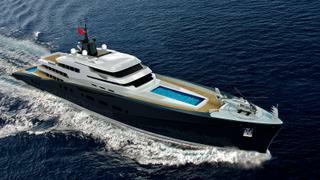 As the name would suggest, a 76 metre motor yacht concept from Dutch studio Mulder Design. Balancing modern technology, timeless style, speed and comfort was the crux of the matter when developing this particular concept. 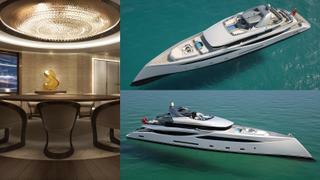 “This is a yacht for people who want the best in terms of quality and lifestyle,” explains designer Bas Mulder. 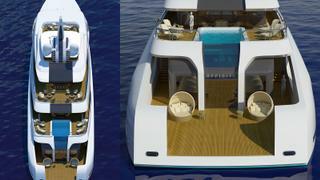 To this end, the concept includes accommodation for up to 12 people and a Jacuzzi on the superyacht sundeck. But it is the main deck that is the undoubted star of the show, with its surprisingly spacious aft-deck pool and on-board cinema room. What is it? 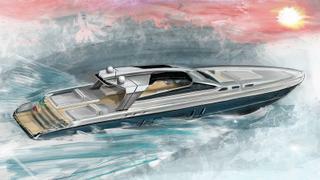 Guido De Groot’s latest design for Dutch yard Vanquish — builder of some of the world’s sleekest and sportiest dayboats. 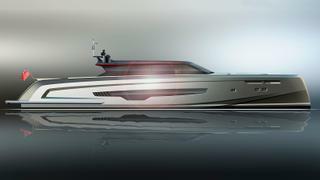 Why we love it This ambitious 28.4 metre concept would push Vanquish into superyacht territory for the first time. De Groot’s inimitable style can be seen throughout, from the reverse-angle bow to the elegantly curved hardtop, which conceals a Targa-style sunroof. Speeds in excess of 50 knots are promised as well as accommodation for up to ten guests. A 19.6 metre and a 22.86 metre version are also on the drawing board. 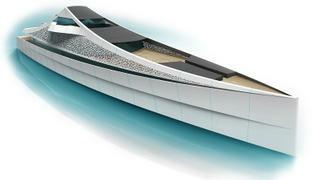 Guido De Groot’s latest design for Dutch yard Vanquish — builder of some of the world’s sleekest and sportiest dayboats. 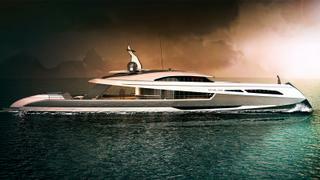 This ambitious 28.4 metre concept would push Vanquish into superyacht territory for the first time. De Groot’s inimitable style can be seen throughout, from the reverse-angle bow to the elegantly curved hardtop, which conceals a Targa-style sunroof. Speeds in excess of 50 knots are promised as well as accommodation for up to ten guests. 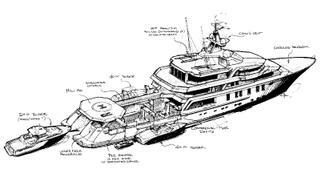 A 19.6 metre and a 22.86 metre version are also on the drawing board. What is it? 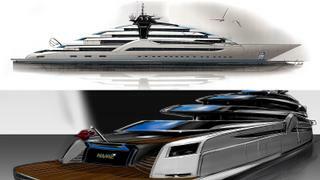 A sharply styled 90 metre concept from Dutch studio Vripack, aptly named after the razor-taloned, keen-eyed bird of prey. Why we love it The open-plan interiors, designed to imbue a feeling of warmth, include a private family deck for the owner and a 20-seat cinema, as well as a spectacular spiral staircase that runs all the way to the sundeck. This comfortable atmosphere influenced the radically retro exterior, which Vripack describes as “neo-classical”. The warm white hull is topped with a superstructure clad in swathes of unvarnished wood and set with green glass. A sharply styled 90 metre concept from Dutch studio Vripack, aptly named after the razor-taloned, keen-eyed bird of prey. The open-plan interiors, designed to imbue a feeling of warmth, include a private family deck for the owner and a 20-seat cinema, as well as a spectacular spiral staircase that runs all the way to the sundeck. This comfortable atmosphere influenced the radically retro exterior, which Vripack describes as “neo-classical”. The warm white hull is topped with a superstructure clad in swathes of unvarnished wood and set with green glass. What is it? A sporty 60 metre penned by Reymond Langton for a client, with a striking reverse bow. Why we love it Pushing the trend towards making more of foredecks, the large glass-fronted superyacht spa pool, built-in seating and sunpads transform the bow into a private, intimate lounge in its own right, rather than a makeshift hideaway with a deckchair or two. There’s also a larger sundeck pool for more sociable swimming. A sporty 60 metre penned by Reymond Langton for a client, with a striking reverse bow. Pushing the trend towards making more of foredecks, the large glass-fronted superyacht spa pool, built-in seating and sunpads transform the bow into a private, intimate lounge in its own right, rather than a makeshift hideaway with a deckchair or two. There’s also a larger sundeck pool for more sociable swimming. What is it? Frank Neubelt’s 100 metre design with a massive swimming pool positioned, unusually, as the centrepiece of the foredeck. Why we love it There are some enviable al fresco spaces on board, including a beach club with sunbathing spaces and a spa pool. But that superyacht swimming pool has an interesting attribute: it can be craned off and replaced with a containerised system to house substantial toys, such as submarines, sailing boats and hovercrafts that may come in useful for entertaining between long passages (Planet 300 is envisioned with a 10,000 nautical mile range at 14 knots). 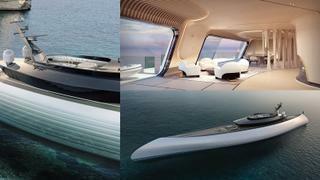 Frank Neubelt’s 100 metre design with a massive swimming pool positioned, unusually, as the centrepiece of the foredeck. There are some enviable al fresco spaces on board, including a beach club with sunbathing spaces and a spa pool. But that superyacht swimming pool has an interesting attribute: it can be craned off and replaced with a containerised system to house substantial toys, such as submarines, sailing boats and hovercrafts that may come in useful for entertaining between long passages (Planet 300 is envisioned with a 10,000 nautical mile range at 14 knots). What is it? The Delta Marine design team conceived this 72 metre as a stylish explorer with a generous wellness area and a helicopter. Why we love it Taking advantage of the ability to mould concave and convex shapes in composite, the graceful superstructure flows around vast expanses of glass, augmented with judicious use of black paint. The graceful lines conceal six decks, with a structure inspired by the mast of a U boat. The lower decks are more casual with a great pool on the aft main deck, close to the water and the beach club, with an incremental transition to more formal spaces on upper decks. The Delta Marine design team conceived this 72 metre as a stylish explorer with a generous wellness area and a helicopter. Taking advantage of the ability to mould concave and convex shapes in composite, the graceful superstructure flows around vast expanses of glass, augmented with judicious use of black paint. 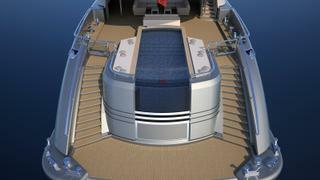 The graceful lines conceal six decks, with a structure inspired by the mast of a U boat. The lower decks are more casual with a great pool on the aft main deck, close to the water and the beach club, with an incremental transition to more formal spaces on upper decks. What is it? An imposing design from the boards of Steve Gresham that takes the Ulstein Group's X-Bow concept to the next level by adding a hybrid Azipod propulsion system capable of delivering a maximum cruising range of 7,000 nautical miles. Why we love it That towering, no-nonsense bow looks like it could handle anything Mother Nature can throw at it (and indeed, it would be built to Ice Class specification), while the ability to carry an Agusta Grand or an EC135 in the aft helicopter hangar is certainly appealing for those looking to explore even further afield. The Seymour Diamond studio is attached to develop the interior, which will include a separate owner’s deck with a forward-facing observation lounge and a superyacht beach club that can convert into a 12.5 metre tender garage. An imposing design from the boards of Steve Gresham that takes the Ulstein Group's X-Bow concept to the next level by adding a hybrid Azipod propulsion system capable of delivering a maximum cruising range of 7,000 nautical miles. That towering, no-nonsense bow looks like it could handle anything Mother Nature can throw at it (and indeed, it would be built to Ice Class specification), while the ability to carry an Agusta Grand or an EC135 in the aft helicopter hangar is certainly appealing for those looking to explore even further afield. The Seymour Diamond studio is attached to develop the interior, which will include a separate owner’s deck with a forward-facing observation lounge and a superyacht beach club that can convert into a 12.5 metre tender garage. What is it? Innovative materials, cutting-edge technology and futuristic design combine in this 80 metre addition to Philippe Briand’s Vitruvius Yachts collection of explorers. Why we love it Briand’s striking design would be built from Krion — a mineral-resin composite that is hardwearing, antibacterial and easy to repair. Science aside, Noble Path balances a radical, futuristic form that appears to lean backwards with classical elements such as latticework in the superstructure, which draws on the Arabic architectural tradition of mashrabiya. More than 1,900GT of interior space allows guests to spread out over five decks, but the best view is reserved for the owner — looking out over the foredeck. Innovative materials, cutting-edge technology and futuristic design combine in this 80 metre addition to Philippe Briand’s Vitruvius Yachts collection of explorers. Briand’s striking design would be built from Krion — a mineral-resin composite that is hardwearing, antibacterial and easy to repair. Science aside, Noble Path balances a radical, futuristic form that appears to lean backwards with classical elements such as latticework in the superstructure, which draws on the Arabic architectural tradition of mashrabiya. More than 1,900GT of interior space allows guests to spread out over five decks, but the best view is reserved for the owner — looking out over the foredeck. What is it? Claydon Reeves’ 52 metre raised pilothouse sailing yacht design that uses organic curves in carbon and glass to mimic the compound eyes of a dragonfly. Why we love it It’s more than a (very) pretty hull. Sparked by an enquiry from a collector of modern sculpture, Dragonfly was developed from Claydon Reeves’ 46 metre Exo sailing yacht concept with Dykstra Naval Architects — the masters of making fantastical designs buildable. The main load bearing elements of the yacht would be built from a carbon monocoque space frame, like a modern motorbike, allowing for massive areas of glass. 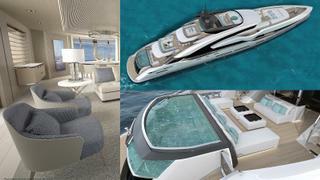 The light-flooded interior includes a split-level saloon and a beach club with a pop-out bathing platform. Claydon Reeves’ 52 metre raised pilothouse sailing yacht design that uses organic curves in carbon and glass to mimic the compound eyes of a dragonfly. It’s more than a (very) pretty hull. Sparked by an enquiry from a collector of modern sculpture, Dragonfly was developed from Claydon Reeves’ 46 metre Exo sailing yacht concept with Dykstra Naval Architects — the masters of making fantastical designs buildable. The main load bearing elements of the yacht would be built from a carbon monocoque space frame, like a modern motorbike, allowing for massive areas of glass. The light-flooded interior includes a split-level saloon and a beach club with a pop-out bathing platform. What is it? A ten-guest, world-roaming concept from Design Unlimited, distinguished by its spectacular winter garden. Why we love it The forward portion of the main deck is given over to an owner’s suite lounge, with floor to ceiling glass on both sides and a retractable glass roof. The feeling of the environment ushered inside — particularly apt given the yacht’s raison d’etre as an explorer — is enhanced with a spa pool in this space, and green walls both here and in the similarly light filled saloon. 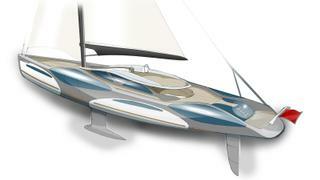 The design is envisioned with hybrid propulsion and a 3,200 nautical mile range at 14 knots. A ten-guest, world-roaming concept from Design Unlimited, distinguished by its spectacular winter garden. The forward portion of the main deck is given over to an owner’s suite lounge, with floor to ceiling glass on both sides and a retractable glass roof. The feeling of the environment ushered inside — particularly apt given the yacht’s raison d’etre as an explorer — is enhanced with a spa pool in this space, and green walls both here and in the similarly light filled saloon. The design is envisioned with hybrid propulsion and a 3,200 nautical mile range at 14 knots. What is it? An elegant superyacht design inspired by an ancient Polynesian canoe, this 115 metre is the latest brainwave from the team that brought us Jubilee – namely Igor Lobanov and Oceanco — while Achille Salvagni conceived the interiors. Why we love it Lobanov is renowned for his out-there exteriors and he certainly hasn’t held back here, with a dramatically curved bow and transom, as well as trick windows consisting of tiny dots that allow views out, but stop prying eyes from seeing in. Salvagni’s achingly cool interior adds another layer of intrigue — who else would have thought to fit teak stalagmites in the upper saloon? An elegant superyacht design inspired by an ancient Polynesian canoe, this 115 metre is the latest brainwave from the team that brought us Jubilee – namely Igor Lobanov and Oceanco — while Achille Salvagni conceived the interiors. Lobanov is renowned for his out-there exteriors and he certainly hasn’t held back here, with a dramatically curved bow and transom, as well as trick windows consisting of tiny dots that allow views out, but stop prying eyes from seeing in. Salvagni’s achingly cool interior adds another layer of intrigue — who else would have thought to fit teak stalagmites in the upper saloon? What is it? A supercar-inspired take on the 26 metre Otam fast planing yacht collection, by design duo Alessio Riccobaldi and Niccolò Pasquini, aka R+P Architecture. Why we love it Gullwing windows over the helm are guaranteed to turn heads wherever you cruise. When closed they allow for spectacular views at speeds of up to 45 knots, but when the anchor’s down and the windows are open, a seamless indoor-outdoor layout, with sunpads and sofas aplenty, really comes into its own. A supercar-inspired take on the 26 metre Otam fast planing yacht collection, by design duo Alessio Riccobaldi and Niccolò Pasquini, aka R+P Architecture. Gullwing windows over the helm are guaranteed to turn heads wherever you cruise. When closed they allow for spectacular views at speeds of up to 45 knots, but when the anchor’s down and the windows are open, a seamless indoor-outdoor layout, with sunpads and sofas aplenty, really comes into its own. What is it? The latest design from the fast-rising Milanese studio, Ganimede takes Hot Lab’s fresh ideas up a gear with 113 metres of Fincantieri form and function to play with. Why we love it Water babies won’t be left wanting more — Ganimede boasts four pools, with the pick of the bunch taking pride of place in the 20 metre long beach club, where it is surrounded by the kind of architectural flourishes that you might expect to find in an art deco mansion. The latest design from the fast-rising Milanese studio, Ganimede takes Hot Lab’s fresh ideas up a gear with 113 metres of Fincantieri form and function to play with. Water babies won’t be left wanting more — Ganimede boasts four pools, with the pick of the bunch taking pride of place in the 20 metre long beach club, where it is surrounded by the kind of architectural flourishes that you might expect to find in an art deco mansion. What is it? Born of the recently forged partnership between ISA Yachts and Team For Design Enrico Gobbi, this design is a glimpse at the next generation of the yard’s successful GT collection. Why we love it Every inch as sporty as the cars that share those famous initials, the GT50 is described as a “coupé of the sea” — a title reflected in its gently curved foredeck and sweeping superstructure arch. But the star of the show is undoubtedly the glass-sided spa pool, situated just above the beach club and guaranteed to catch the eye of anyone stepping on board. Born of the recently forged partnership between ISA Yachts and Team For Design Enrico Gobbi, this design is a glimpse at the next generation of the yard’s successful GT collection. Every inch as sporty as the cars that share those famous initials, the GT50 is described as a “coupé of the sea” — a title reflected in its gently curved foredeck and sweeping superstructure arch. But the star of the show is undoubtedly the glass-sided spa pool, situated just above the beach club and guaranteed to catch the eye of anyone stepping on board. What is it? The Italian commercial yard’s determined push into the superyacht sector continues with this new sub-500GT globetrotter. Why we love it The exterior balances dynamic lines, penned by Tommaso Spadolini, with a reassuring sense of ruggedness, backed up by a transatlantic range at ten knots. Inside, contrasting light and dark elements in both the woodwork and the soft furnishings form the basis of a chic decorative palette. This theme starts in the saloon and is carried through to all five of the guest cabins. The Italian commercial yard’s determined push into the superyacht sector continues with this new sub-500GT globetrotter. The exterior balances dynamic lines, penned by Tommaso Spadolini, with a reassuring sense of ruggedness, backed up by a transatlantic range at ten knots. Inside, contrasting light and dark elements in both the woodwork and the soft furnishings form the basis of a chic decorative palette. This theme starts in the saloon and is carried through to all five of the guest cabins. What is it? A conceptual design by J David Weiss of Designova Creative, the Seablade series was born of a discussion with a client seeking a yacht below 500GT with expansive main deck space. Why we love it Beauty is built right into this concept, which explores simplicity of form translated in particular into an “S” profile from the top of the wheelhouse to the stern. The design could be lengthened far beyond the 50 metre limit normally associated with the 500GT threshold without tipping the scale. A conceptual design by J David Weiss of Designova Creative, the Seablade series was born of a discussion with a client seeking a yacht below 500GT with expansive main deck space. Beauty is built right into this concept, which explores simplicity of form translated in particular into an “S” profile from the top of the wheelhouse to the stern. The design could be lengthened far beyond the 50 metre limit normally associated with the 500GT threshold without tipping the scale. What is it? The next step in the Gotham Project by ER Yacht Design, for Dutch builder Icon and broker Bristow-Holmes, is the ER175 — a conceptual design for a 53 metre yacht with a total interior volume of less than 500GT. Why we love it Its confident, aggressive looks are attention-grabbing but it’s the aluminum yacht’s potential capabilities that really appeal — a possible top speed of 20 to 25 knots but also transatlantic range. Under Ivan Erdevicki’s signature winged mast are three full decks plus a flybridge, all aptly concealed within the ER175’s futuristic styling. 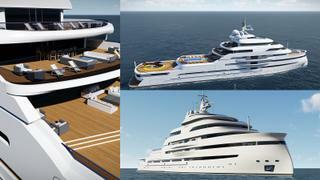 Optional features include a pool and helipad. The next step in the Gotham Project by ER Yacht Design, for Dutch builder Icon and broker Bristow-Holmes, is the ER175 — a conceptual design for a 53 metre yacht with a total interior volume of less than 500GT. Its confident, aggressive looks are attention-grabbing but it’s the aluminum yacht’s potential capabilities that really appeal — a possible top speed of 20 to 25 knots but also transatlantic range. Under Ivan Erdevicki’s signature winged mast are three full decks plus a flybridge, all aptly concealed within the ER175’s futuristic styling. 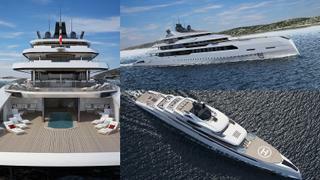 Optional features include a pool and helipad. What is it? 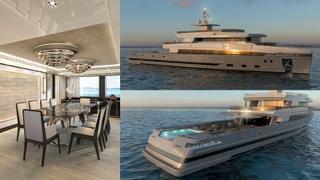 A Luiz de Basto explorer yacht concept for the Burger Boat Company, the 105 Explorer is based on the recently delivered 31 metre Northland, also by de Basto. Why we love it The vertical bow and geometric lines give this yacht the tough looks of a go-anywhere explorer and allow for up to five cabins, including a main-deck master suite. The bathing platform expands with foldable sides, creating a great staging area for tenders and toys or even a meal by the water’s edge. At just 32 metres overall, this explorer packs a lot into a manageable size. 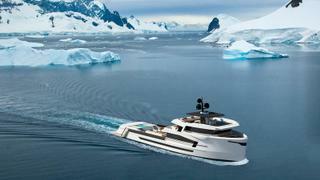 A Luiz de Basto explorer yacht concept for the Burger Boat Company, the 105 Explorer is based on the recently delivered 31 metre Northland, also by de Basto. The vertical bow and geometric lines give this yacht the tough looks of a go-anywhere explorer and allow for up to five cabins, including a main-deck master suite. The bathing platform expands with foldable sides, creating a great staging area for tenders and toys or even a meal by the water’s edge. At just 32 metres overall, this explorer packs a lot into a manageable size. What is it? A reboot of Cantieri Navali Chioggia’s tough natured Naucrates 88, this original 39 metre explorer design is by Green Yachts Studio. Why we love it Appearing to lean forward thanks to its reverse windshield, and designed with a high bow, this explorer looks ready to go anywhere. The main deck uses the full ten metre beam, which means there are many options for the interior layout, and abundant recessed glass ensures natural light throughout. The concept melds entertainment and utilitarian spaces seamlessly with, for instance, the possibility of covering the pool to create a helipad. A reboot of Cantieri Navali Chioggia’s tough natured Naucrates 88, this original 39 metre explorer design is by Green Yachts Studio. Appearing to lean forward thanks to its reverse windshield, and designed with a high bow, this explorer looks ready to go anywhere. The main deck uses the full ten metre beam, which means there are many options for the interior layout, and abundant recessed glass ensures natural light throughout. The concept melds entertainment and utilitarian spaces seamlessly with, for instance, the possibility of covering the pool to create a helipad. What is it? This is a concept for Polish shipyard Conrad by ISA Yachts’ long-time design partner, A Vallicelli & Co. Why we love it Studio Vallicelli has deep roots in sailing and from this the designers draw a great sense of efficiency of spaces and lines. This helipad-capable 70 metre yacht can be built with a large pool aft on main deck connected to a beach club — or without at the owner’s choice. 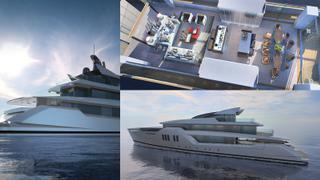 This is a concept for Polish shipyard Conrad by ISA Yachts’ long-time design partner, A Vallicelli & Co. Studio Vallicelli has deep roots in sailing and from this the designers draw a great sense of efficiency of spaces and lines. This helipad-capable 70 metre yacht can be built with a large pool aft on main deck connected to a beach club — or without at the owner’s choice. What is it? 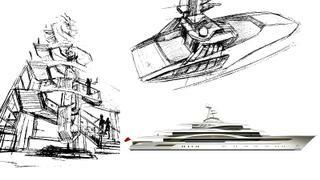 A project from the design team behind 101 metre I Dynasty, this slender 85 metre tri-deck, an evolution of an earlier concept by The A Group, based in Monaco, was developed in collaboration with SuperYachtsMonaco. Why we love it One of the design’s aims is to provide ample comfort for 12 guests while keeping the gross tonnage below what is usual in this size range. This translates into an elegant yacht, with an unbroken sheerline and abundant glass, which focuses on wellness with a great spa. A project from the design team behind 101 metre I Dynasty, this slender 85 metre tri-deck, an evolution of an earlier concept by The A Group, based in Monaco, was developed in collaboration with SuperYachtsMonaco. One of the design’s aims is to provide ample comfort for 12 guests while keeping the gross tonnage below what is usual in this size range. This translates into an elegant yacht, with an unbroken sheerline and abundant glass, which focuses on wellness with a great spa.